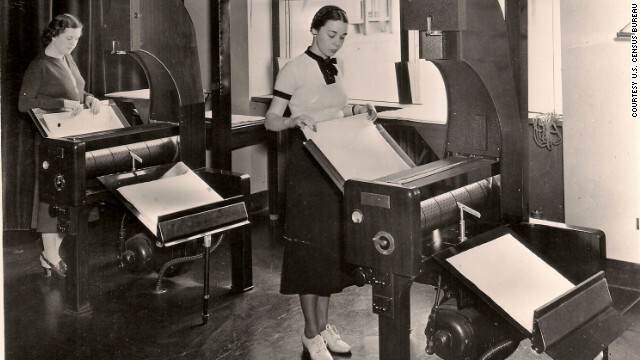 Census Bureau employees process microfilm records, circa 1940 -- now, the records are online. Opinion: Why the huge interest in the 1940 U.S. Census? Editor's note: Michael S. Snow is a historian on the history staff of the U.S. Census Bureau. (CNN) - A reporter last week asked me if many people cared about the release of individual records from the 1940 Census. "Are they just a historic relic?" was the followup from someone else unimpressed that the general public would finally have access to more than 100 million census records locked away for 72 years. Americans answered those questions loud and clear. The National Archives and Records Administration website housing 1940 Census records registered over 60 million hits in just three hours on Tuesday, April 3, 2012, the second day they were open. The outpouring of demand for such information calls on us to examine what is driving it. The individual records help Americans gain a greater sense of who our ancestors were and with it an understanding of the blood that runs through our own veins. Each image from the 1940 Census is a lined page called a population schedule, containing the records of up to 40 individuals. They might not look like much - the penmanship of 123,000 census takers varied, the cursive may be hard to read, ink from fountain pens ran too light on some letters. One line on a 1940 Census record, however, has the power to confirm a family legend we have heard for years, or it can make us confront a troubling truth buried long ago.